There's a chill in the air, the days are getting shorter, and the water is getting colder, but the Sunfish racing is still hot. Six intrepid souls showed up to race on a nearly perfect day. Consistency was the order of the day, with the finishing order virtually carved in stone from race to race. Out of the six races held today, Gary Werden took 5 firsts, Dave Ryan took 5 seconds, Mark Stoughton took 5 thirds, Bernadette Levesque took 4 fourths, John Houstle took 4 fifths (and finished second to last in every race), and Alan Dimson Doyle took a third and 3 sixths in the four races he took part in today. For the season, ONE point separates first, second and third places overall. Mark Stoughton gets first place via a tiebreaker, because he and Bernadette Levesque are tied for first with 70 points each. John Houstle is in 3rd with 71 points. Talk about a close series! After the racing, a bunch of racers stayed on the beach, enthusiastically talking about the races and exchanging stories and tips until dark, and lamenting that the season is soon coming to a close. Or not. 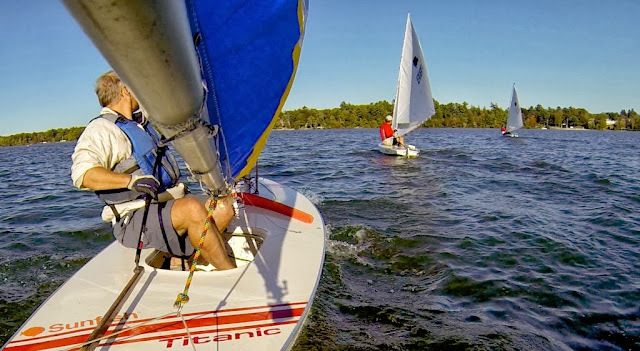 Three of MYC's Sunfish racers have already committed to visiting the Barrington Yacht Club for their frostbite series, which starts on the very day that we are closing up the club for the season. Two more racers are seriously considering racing there in the fall as well. Thanks to Michael Ganshirt, who served as Race Committee for the day. He set up a perfectly square course that held up for all of the races. Not bad for a first time out!